I first heard about the 'Just a Card' campaign via Twitter about two years ago. The campaign came about when Artist & Designer Sarah Hamilton saw the quote "If everyone who'd complimented our beautiful gallery had bought 'just a card' we'd still be open" by store keepers who'd recently closed their gallery. This prompted a call to action! 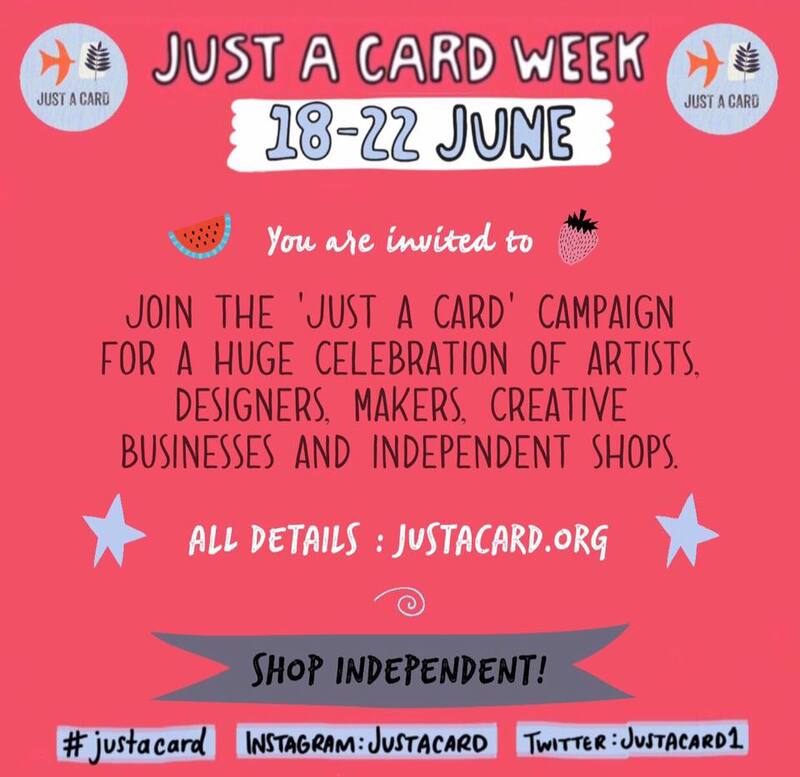 Designer/Makers and independent shops and galleries need a voice. People seldom realise the considerable costs involved in exhibiting at design shows or keeping a shop open. Stand fees, power, materials, wages etc need to be met before even a penny of profit can be realised. Running a shop is often a labour of love. Without dedication and passion, and crucially sales, it would be another boarded up eyesore. The 'Just a Card' campaign has gone from strength to strength. It brings designers, artists, shop owners and the wider public together to create a truly thriving creative community. Despite the name, the campaign is about more than buying just cards. Every single mug, pin, cushion, print or book you buy from an independent shop or designer makes a huge difference. 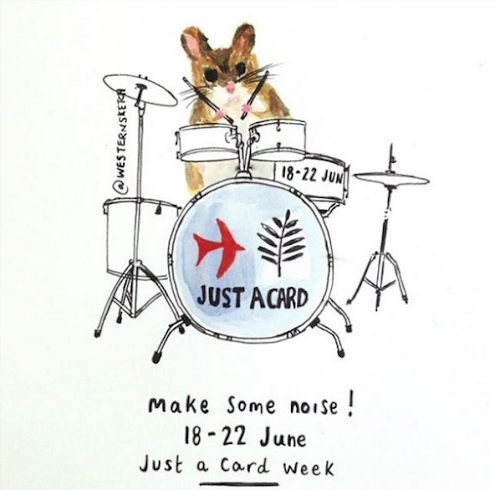 To celebrate and build on this success, Just a Card is inviting everyone to participate in JUST A CARD week on 18 - 22 JUNE! Everyone passionate about creativity and independents is invited to share their stories on Social Media, and their work places too. 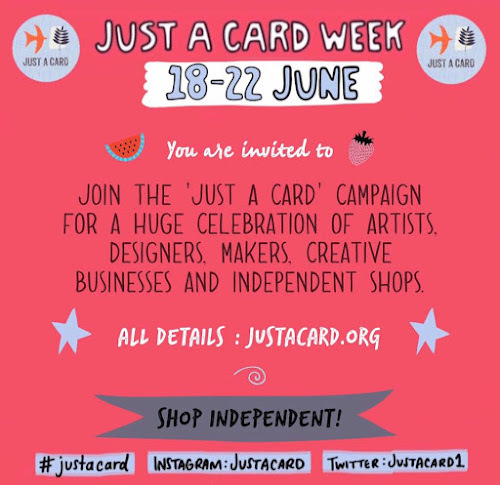 People are asked to celebrate the contribution independent shops and creatives make, plus post images of the hundreds of JUST A CARD stickers, encouraging people to support independents, which are popping up in shop windows all around the country. I used to be a Features Writer for UK Handmade Magazine and have interviewed a number of designer makers. I know how much dedication and hard work goes into running an independent business. We need to celebrate all the people who put so much effort into keeping their creative dreams alive. 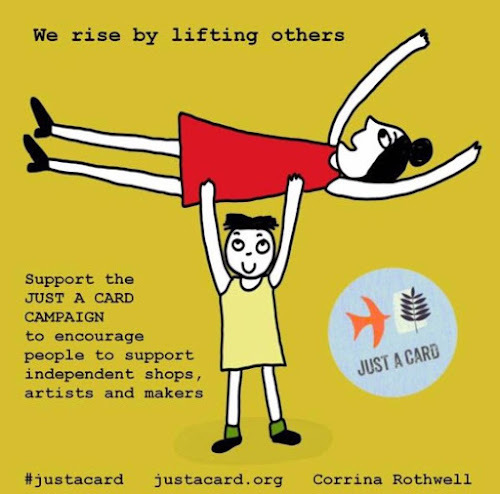 I think the JUST A CARD initiative is wonderful and I urge you to join in and spread the word.